Catch Prosthetic Records acts PSYCROPTIC and VENOM PRISON on this year’s Devastation On The Nation tour! Kicking off the North American trek this Friday, May 25th; the tour will see VENOM PRISON and PSYCROPTIC join ABORTED, INGESTED, DISENTOMB, ARKAIK, SIGNS OF THE SWARM (select dates), and VALE OF PNATH (select dates). All dates below. For a taste of PSYCROPTIC; check out the official music for the song "Cold," off their previously released, self titled album here: https://youtu.be/Bquz9LScP3E. 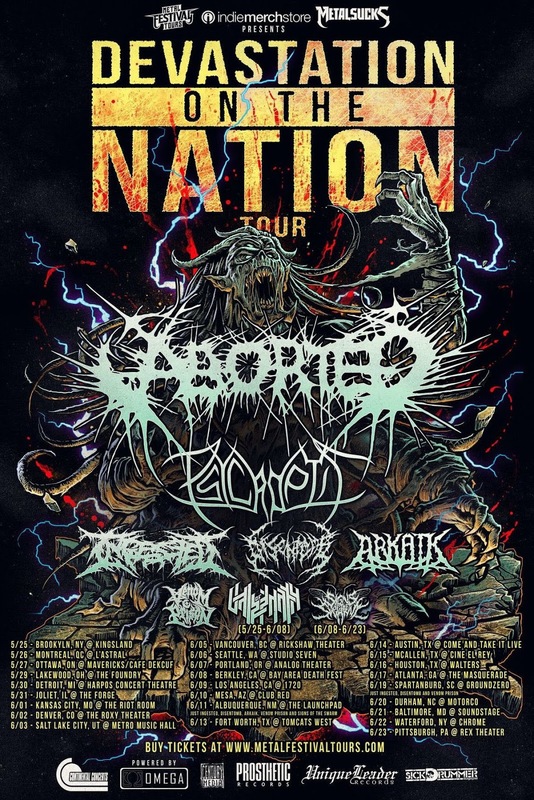 Fresh off their European tour with TRIVIUM, CODE ORANGE & POWER TRIP; Progressive death standout VENOM PRISON will make their first ever- U.S. tour joining their label mates PSYCROPTIC on The Devastation On The Nation Tour. The current and critically acclaimed VENOM PRISON album, Animus continues to receive accolades, recently landing the band among select finalists for the 2018 Heavy Music Awards in the BEST UK BREAKTHROUGH BAND category.